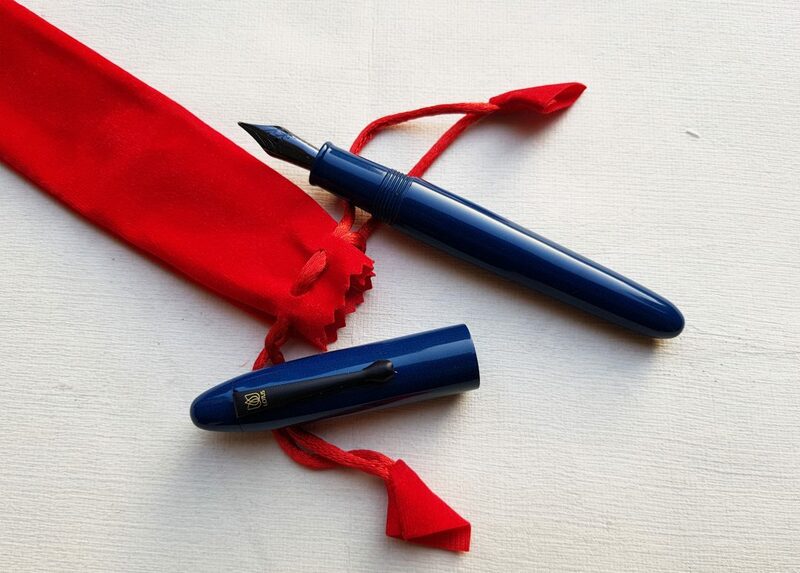 This pen was available for review on FPN for review and was made available by Just Write Company and I happened to be at right place at right time and also I was lucky enough to be selected amongst many to review this pen. I thank Kevin for sending me across the pen and later on the inks too for review. I have extensively used this pen and this actually is detailed review of the pen. The pen arrived in very well packaged PU leather zip case along with the spare JoWo nib as the pen was available for review with two nib options. The pen is available in 2 options with 3 different trims. Two finishes were PU Leather and Carbon Fibre , both in black colour. And the trim options were Gold, Silver and Black Titanium. And I opted for the PU leather finish with black titanium trim. Well it is actually a kit pen and is known as CHURCHILL FOUNTAIN PEN KIT. The pen arrived and the first impression was “Wow.. its a hefty pen” and in actual it weighs around 30 g when uncapped. I think the Jinhao 159 almost weighs in the same category. The pen is made of brass except the ABS plastic grip section. The finials are brass also with black paint finish. The cap and barrel are finished with very nice warm textured PU leather finish. It feels very good in hand unlike the cold metal in your hand. I can almost compare it with feel of ebonite in my hand. The pen is cylindrical with rounded edges and bullet shaped bottom finial which is painted and I think this finish will wear off after some wear and tear. The grip section has hourglass design, which I really like. The pen is well detailed out with nice addition of trims with double centre band and triple band at bottom of barrel. There is also one band at cap top along the clip. All are nice and sturdy. There is small O ring at the junction of cap and barrel also. Overall the pen is very well finished and executed in detail and is very well built and I must say the quality control was stringent as the pen I received had perfectly aligned rings at regular spacing. The cap has cylindrical finial in painted finish and the centre portion of the cap has PU Leather finish and the cap lip is again painted finish with double bands. As far as cap clip is concerned I really like the design and the clip is stiff and sturdy but not springy. As far as the branding goes the name “Axiom” is not mentioned anywhere, only brand name “Blackstone” is mentioned below dual centre band on cap. I must say its a very well built pen. Though the pen is hefty some may not like it (e.g. my wife) but I do like it. This pen looks classy. Few things i don’t like are triple bands at bottom, I think dual bands would have served the purpose well. As I mentioned earlier the pen is a hefty one and the bottom finial is also heavy which actually balances the brass barrel. Thus this pen is a bottom heavy pen. When cap is not posted most of the weight is in centre but when cap is posted at back more than 2/3 rd weight goes to the back, thus making it uncomfortable. The pen comes with option of #6 JoWo Ruthenium nib in EF, F, M, B, 1.1, 1.5. I took up M and 1.1 and this particular review was written with 1.1 calligraphy nib. It wrote amazing and very well. Even though JoWo nibs have never disappointed me still I have had bad experience with JoWo #5 Chrome finish 1.1 nib but this one was amazing even the ruthenium finish was matching with black titanium trims. Ink Filling is via converter or cartridge. The pen comes with good quality converter which is not Schmidt made. The pen can’t be converted to eyedropper as it is a metal pen. It is extremely well built hefty kit pen with excellent #6 JoWo Ruthenium nibs. Priced around 70 USD puts it in mid range segment. I recommend this to people who want hefty and classy looking pen. This is an excellent review, thanks for reviewing..